NOTE: It is recommended that you confirm that the latest firmware is installed on your device by visiting the Brook Device Support page, downloading the firmware update app, and following instructions in the manual. Links to Brook device firmware update information and instructions are available in the Support tab. The Dreamcast, Sega's final push into the home entertainment console market, marked one of the highlights of the company's history before bowing out of the console race, later offering multi-platform software. The console's software lineup was top-notch, with Capcom as one of their most ardent supporters since the Sega Saturn. This support led to the appearance of some of the FGC's most played titles in a format deemed true to arcade, such as Marvel vs Capcom 2, and Capcom vs SNK 2. 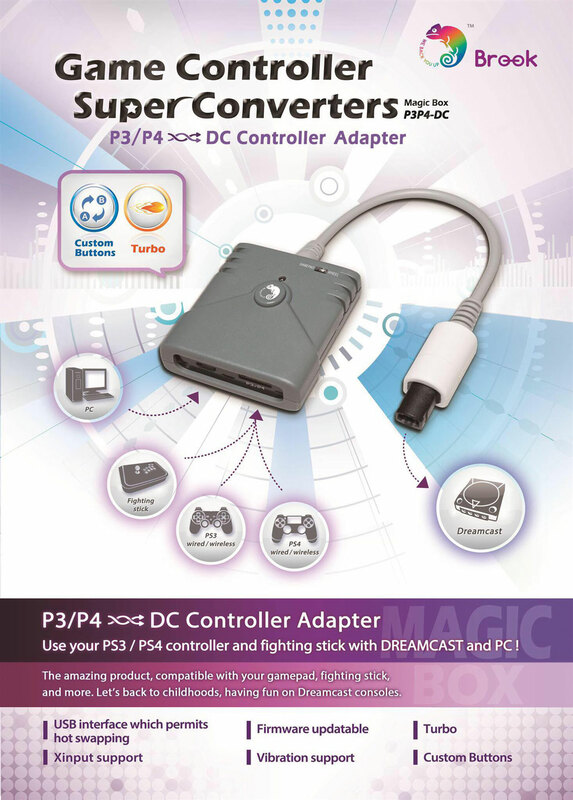 The Brook Super Converter is a USB-based adapter designed to convert your Playstation 3 or Playstation 4 peripheral for use in Sega's original Dreamcast console. Please note that upgrading to the latest firmware is required to utilize this feature. While the device does not support VMU hardware, it can now save up to 40 blocks of VMU memory directly to its own device. 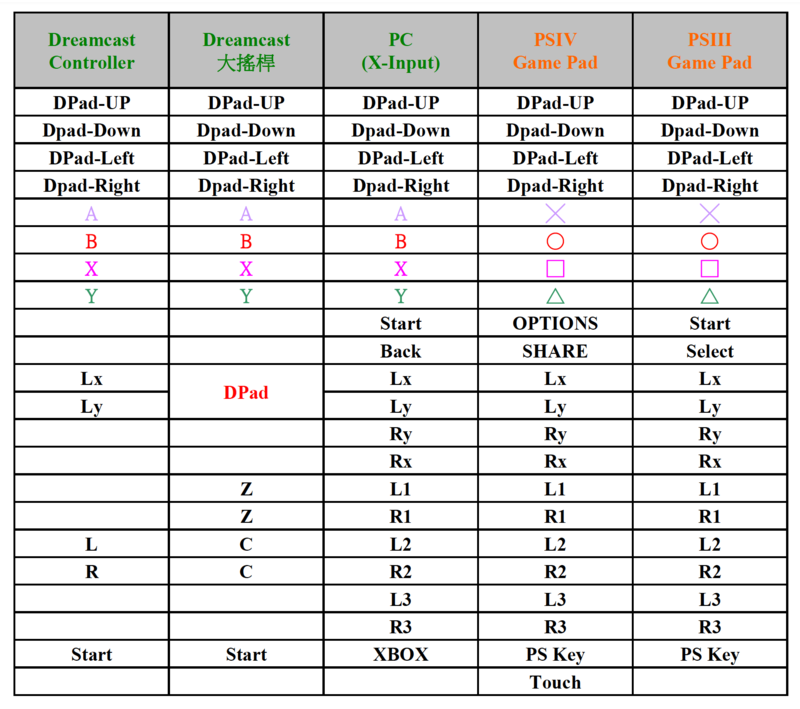 For many wishing for the opportunity to save their games without switching to an original Dreamcast controller on another port, this is quite beneficial. The Brook Super Converter has several convenient features to improve the control experience. Accepts FightSticks, wired and wireless Playstation 3/4 gamepads, and amongst other original and 3rd party PS3 and PS4 compatible peripherals. In addition, the Brook Super Converter is firmware upgradeable, which can be used to improve functionality, and add new features. Firmware updates are performed by attaching your device to a Windows PC, or Mac with Boot Camp partition or Parallels Virtual PC software. As of now, the Brook Super Converter is allowed by EVO, one of the most popular global tournament events. Often EVO's policies are adopted at smaller tournaments. This policy is a tentative acceptance - should the converter become disabled via Sony firmware update before EVO, it could face a ban. You can learn more about it here (Opens in new window). The Brook Super Converter comes in its own professionally designed box. In the box is the device; paper instructions are also included in English and Taiwanese. Visit here to download the latest firmware update for this device. For PS3/PS4 Analog Controller: Directly plug the converter into port. The converter will set in "Controller" mode. The LED indicates Red. For Arcade Fightstick: Hold on Buttonthen plug the converter into port, The converter will set in "Arcade Stick" mode. The LED indicates Green. This Converter defaults the buttons to just where they should be on the arcade stick--and the firmware update enabled it to act as a DC memory card with 40 blocks of storage, which has worked just dandy. I've had to take at least a star off this one's rating though because I've bought two of these DC Super Converters now, and within several days of use, both have had the outer gray wire sheath pull free or split from the plug that goes into the Dreamcast's controller port. I contacted Brook about it and they got back right away to say "Thank you for your advice, we will feedback to R&D team and improve it. Please try to contact your seller for a replacement."